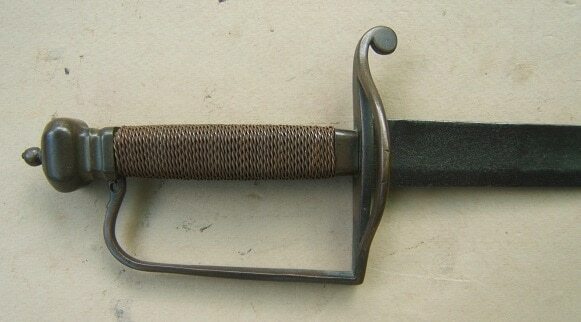 A FINE & RARE AMERICAN REVOLUTIONARY WAR PERIOD FRENCH MODEL 1763 “CHARLEVILLE” MUSKET BAYONET, ca. 1770 (Ex. 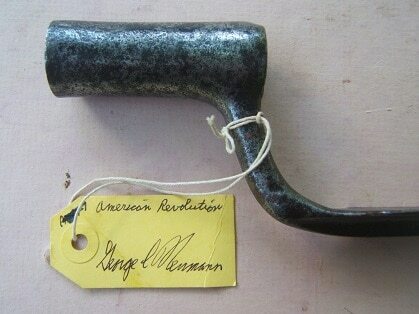 GEORGE C. NEUMANN COLLECTION): In overall fine condition. The regulation Pattern, tapered, triangular-form, 13 3/4″, flat blade with a fluted bottom and a deep “French” type blood-groove, at its tip. The base of the blade with a “K” & “V” French Arsenal marking of classic Rev. War Period form. Open-type Mdl. 1754/1763 socket of regulation design with a “Z” shaped lug-slot. In very good+ near fine untouched condition with smooth, steel-gray, steel surfaces and some isolated patches of discoloration/expected fine scattered pitting. 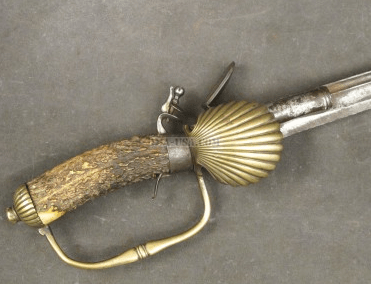 A very nice example of a scarce American Revolutionary War Period Charleville Musket Bayonet with evidence of American Usage. Of the type most frequently supplied by France to aid the American Revolutionary cause; and often used on Model 1766/68 Model Muskets. Overall length, 18″ From the collection of noted Author & Historian George C. Neumann and accompanied by a Collection tag of provenance. For a similar example, please see Neumann’s: “Swords& Blades of the American Revolution”.